Deluxe Shield RV Covers are great outdoor covers. They offer amazing protection against rain and the elements. The Deluxe Shield RV cover is safe to use in all types of weather conditions. It is water resistant and is great for high moisture climates. This cover has a unique and lightweight design featuring 3 layers on top and 1 layer on the sides. The Deluxe Shield is made of a special multi-layer polypropylene, which is an oil based material, with a layer of micro-porous film sandwiched between it to ensure breathability. On the inside of the cover, there is a non abrasive interior. Built-in vents help reduce wind stress and prevent mold from trapped moisture. Adjustable tension panels at front and rear built in plus elastic hem corners ensure a snug fit. Integrated rope with weighted toss bag designed to help reduce crawling under the RV. Zippered panels allow quick and easy access to doors and engine. Chemically treated for UV stability. Why are there no mirror pockets? Our RV covers will accommodate your mirrors without pocketing them. We've engineered them out of the design because mirror pockets are unnecessary and are usually the first part of an RV cover to deteriorate or rip. 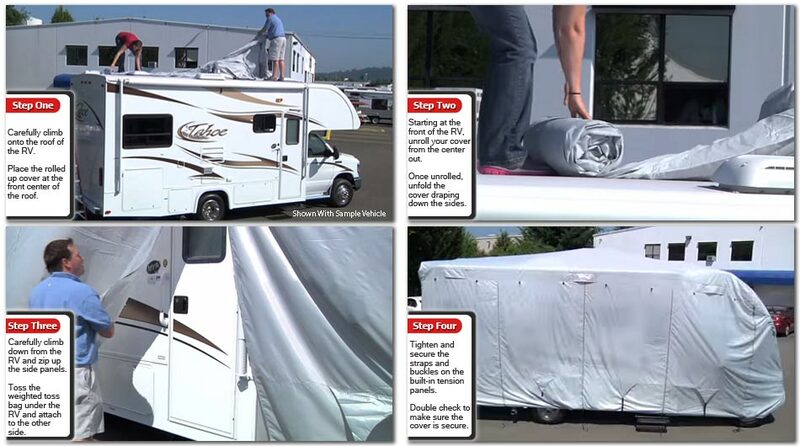 This ensures that you will get maximum durability from your RV cover! Will this fit my RV? Yes! This cover is sized for your vehicle by the dimensions: length, width, and height (called semi-custom). Combine the perfect size with the reinforced securing straps and you are getting a cover that is going to fit your vehicle very well. We're so confident that you'll love how our cover fits your vehicle that we will pay return shipping if you receive an incorrect cover! The Deluxe Shield RV cover comprised of 3-layers. Not all three layer covers are made equal however. The Deluxe Shield is made from a special multi-layer polypropylene, with a layer of micro-porous film sandwiched between it to ensure breathability. This cover comes with a FREE storage bag and an INCREDIBLE 3 YEAR WARRANTY! Keep your car clean with the Microfiber car dusting kit. This kit includes a 100% microfiber car duster (25" long) and three (3) high quality 100% microfiber cloths. Colors may vary. If you would like your order to be shipped out same day, add Rush Processing to your order! 3:00pm EST Cutoff Time.